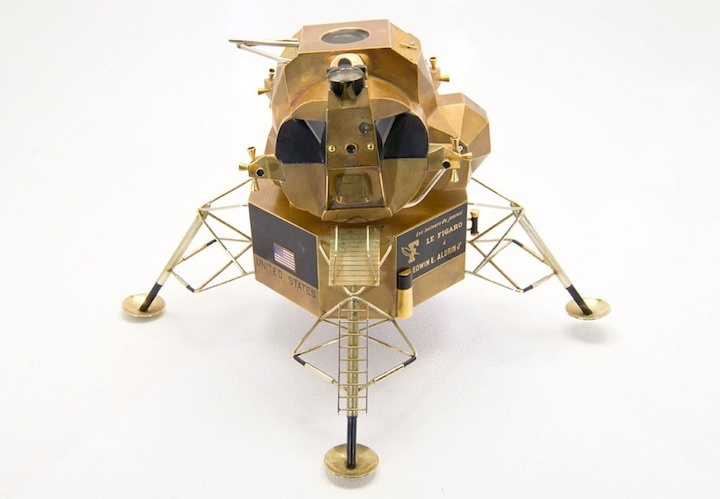 – A solid gold model of NASA's Apollo lunar module is now up for auction, as one of the only two others in existence remains missing after a museum heist. Astronaut Buzz Aldrin's gold scale model of the spacecraft that he and Neil Armstrong piloted to the first moon landing in July 1969, promptly exceeded its opening bid of $10,000 at RR Auction's space memorabilia sale on Thursday (Nov. 9). The Boston-based firm expects that the Cartier-crafted model will command $150,000 or more by the close of the auction on Nov. 16. 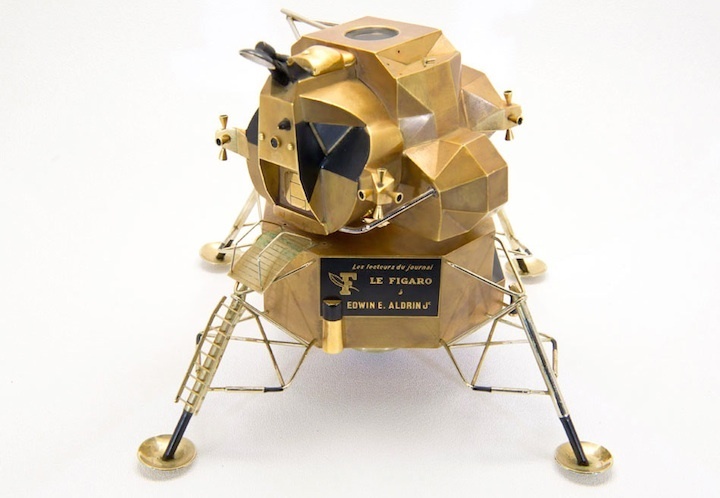 "Intricately reproducing the iconic lunar module in solid [18 karat] gold and presented to one of the first humans on the moon, this is a spectacular piece of the utmost rarity," said Bobby Livingston, executive vice president at RR Auction. 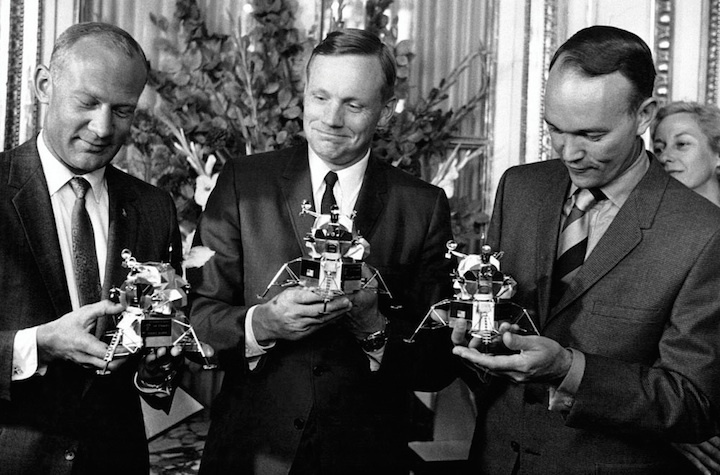 The French jeweler Cartier was commissioned to produce the three gold lunar modules by the newspaper "Le Figaro" for presentation to Apollo 11 crew of Armstrong, Aldrin and Michael Collins during the astronauts' post-mission visit to Paris in October 1969. Le Figaro invited its readers to help underwrite the models' creation and they gave generously. The names of the newspaper's supporters and subscribers were listed on microfilm rolls that were hidden inside each of the models, secreted under the descent stage engine. A plaque affixed to the front of each model also notes that is it a gift from "Les lecteurs du journal Le Figaro" (in English, "Readers of the newspaper Le Figaro"). Collins' gold lunar module was auctioned in 2003 for more than $55,000. Cartier reacquired it and it is now part of the jeweler's collection. Armstrong's model was displayed at the Armstrong Air and Space Museum in Wapakoneta, Ohio – the late astronaut's hometown – until July of this year, when a thief absconded with it, as well as several awards and medals that were on exhibit alongside the model. To date, the artifacts have not been recovered. Aldrin divested of his gold model some time ago and he is not directly involved in its present sale. At some point in its history, Aldrin's model was separated from its red leather, pyramidal case and sustained some damage. A few pieces of the lunar module are missing, including an ascent stage support post, supporting brackets near the ladder, and the antennas on top. The model also exhibits some tarnishing to its golden finish. Cartier has told RR Auction it is willing to restore the lunar module at its Paris facility at the winning bidder's expense. "The moon landing is one of the greatest achievements of mankind. This Cartier model pays tribute to the bravery of the Apollo 11 astronauts," stated Livingston. RR's sale, which features the space memorabilia collection of the late inventor of the aftermarket air conditioner for the Volkswagen Beetle in 1969, includes some 20 other lots of Apollo 11 mementos among the 200 total items. One of the highlights is a page from the mission's flown Lunar Module Activation Checklist, with Armstrong's notations listing the steps to prepare for undocking with the command module Columbia prior to the lunar landing. Also for sale are letters from Collins and Aldrin, including a 1976 note from the latter describing the view on the moon as "very stark and absolutely without any color, just black and shades of gray."